Although the game bird season (in Auckland/Waikato) may be over, there are bound to be bagged birds waiting to top the table. Thanks to Al Brown and Fish & Game NZ, we have a sure fire recipe that’s bound to impress. Brining the breasts overnight keeps them beautifully tender and pink when sliced for this salad. With a sharp knife, score the skin of the duck breasts diagonally in a crisscross pattern. Place the duck breasts in the brine and refrigerate for at least 8 hours or preferably overnight. Remove the duck from the brine, rinse under cold water then pat completely dry. Keep on a cake rack, uncovered, in the fridge until ready to smoke. Place a sauté pan on low heat for a good 5 minutes then place the duck breasts skin side down in the pan. Leave for 5-10 minutes to render as much fat as possible, pouring the fat off the pan as it is released. The skin will begin to brown as the fat renders. Do not turn. Remove once the skin is golden brown all over. Set up your smoker outdoors in a sheltered position. Sprinkle the wood chips and tea in the bottom of the smoker. Place the rack with the duck breasts over the chips, secure the lid, then place the smoker over the burners. Depending on the amount of heat generated, check the duck breasts after 7 minutes then at 3-minute intervals after that. The breasts should be medium in doneness and have a good smoky flavour and colour. Remove and rest while you make the salad. 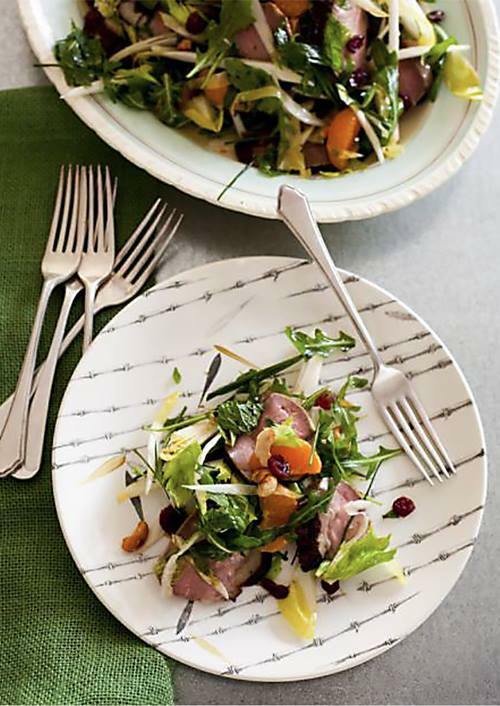 Slice the duck breasts as thinly as possible and toss with the salad.